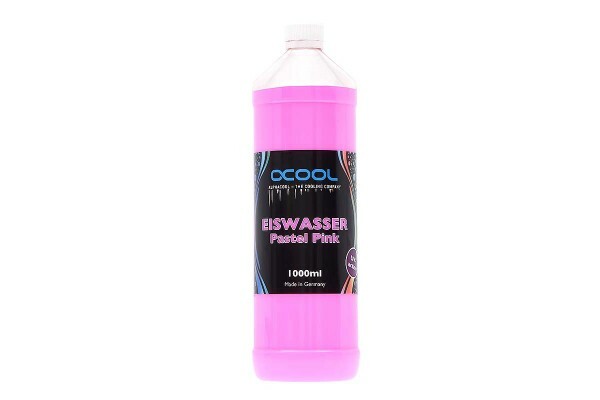 Alphacool Eiswasser Pastel is a “made in Germany” show coolant. It’s a welcome addition to the wide range of water cooling components and is perfect for bringing out the best in other components. The visual effect is stunning: rich colours, maximum colour density and opacity (also known as fog effect), as well as flow distribution during filling, in a container, or in tubing or HardTubes. The Eiswasser Pastel has modding fans’ hearts skipping a beat. To amp up the effect even further, most colours are also available in a UV-reactive version. The Alphacool Eiswasser Pastel UV Series has a cool glow effect under suitable UV lighting. Combined with the Alphacool Aurora Ring in a transparent reservoir or CPU cooler, UV coolant is truly in its element. Alphacool Eiswasser Pastel was tested in Alphacool’s lab for over 1.5 years. A lot of focus was placed on keeping the colour particles, which create that characteristic fog effect, as small as possible. This allows particle deposits that form after periods of inactivity to break up easily and keeps particles from clumping up. Please note that despite many technical improvements, Pastel coolant should be used as pure modding or show coolant only for short term use. After long periods of inactivity, colour particles can form deposits and possibly clog components or the pump. We recommend running the system daily for at least one hour in order to avoid or delay particle buildup. Due to the intensity of the colours, clothing and other materials that come into contact with the colour may be stained. Please take care not to spill during use. In order to be able to use a permanently colored system, the Eiswasser liquids of the Crystal series are suitable for a longer operation!